Washington DC is located in the Mid-Atlantic region of the East Coast of the United States between Maryland and Virginia. The nation's capital is approximately 40 miles south of Baltimore, 30 miles west of Annapolis and the Chesapeake Bay and 108 miles north of Richmond. To learn more about the geographic locations of cites and towns surrounding Washington DC, See a Guide to Driving Times and Distances Around the Mid-Atlantic Region. 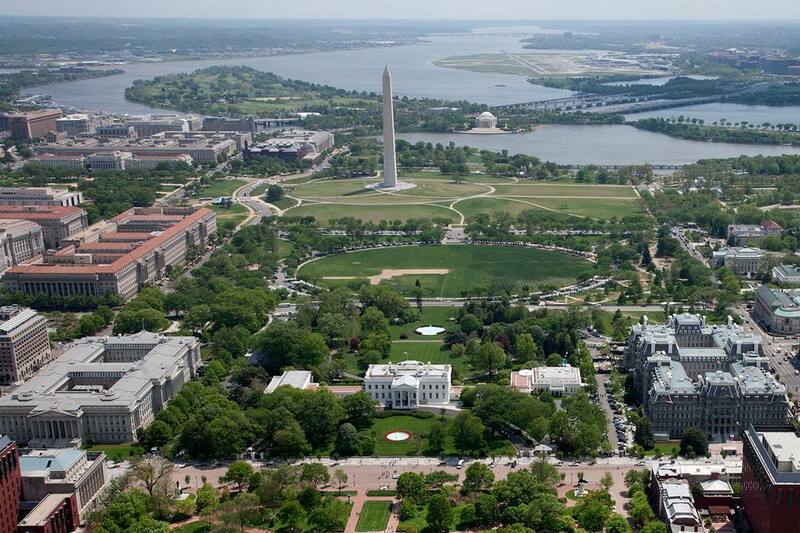 The City of Washington was founded in 1791 to serve as the U.S. capital under the jurisdiction of Congress. It was established as a federal city and is not a state or part of any other state. The city is 68 square miles and has its own government to establish and enforce local laws. The federal government oversees its operations. For more information, read DC Government 101 - Things to Know About DC Officials, Laws, Agencies and More. Washington DC is relatively flat and located at 410 feet above sea level at its highest point and at sea level at its lowest point. The city’s natural features are similar to the physical geography of much of Maryland. Three bodies of water flow through DC: the Potomac River, the Anacostia River and Rock Creek. DC is located in the humid subtropical climate zone and has four distinct seasons. Its climate is typical of the South, with humid and hot summers and fairly cold winters with occasional snow and ice. The USDA plant hardiness zone is 8a near downtown, and zone 7b throughout the rest of the city. Read more about Washington DC Weather and Monthly Temperature Averages. Washington DC is divided into four quadrants: NW, NE, SW and SE, with the street numbers centered around the U.S. Capitol Building. Numbered streets increase in number as they run east and west of North and South Capitol Streets. Lettered streets increase alphabetically as they run north and south of the National Mall and East Capitol Street. The four quadrants are not equal in size.